This dictionary aims to enhance the understanding and usage of the Maltese language from a young age. The Dizzjunarju tal-Malti ghall-Iskejjel is an essential tool that will help each student achieve the desired success in Maltese. 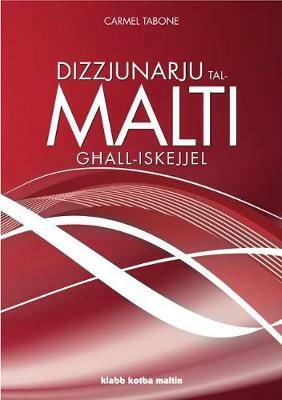 The Dizzjunarju tal-Malti ghall-Iskejjel includes more than 12,000 entries of modern Maltese. Each word is printed in large type and defined in a clear simple way. The dictionary includes also a number of practical examples using the words in sentences, expressions and idioms to help understand the words in their context. The dictionary also includes a dictionary of proverbs and idios, days of the week, months of the year, time, towns and villages in Malta, people of the world and numbers. This dictionary is a valuable and necessary tool for those studying Maltese and wish to use it better. It is ideal not only for students but also for everyday use.